Timucuan Longhouse members love to bowl. The kids love it. The parents love it. We bowl six times over the summer during the rose and thunder moons while the program is largely in hibernation. 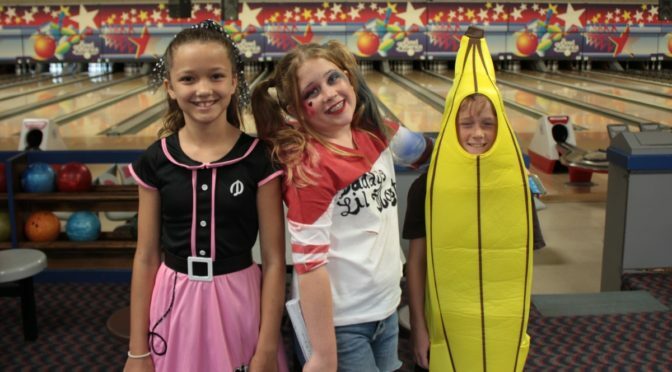 These summer bowling sessions are where our members refine their skills and improve their scores for the annual competition that occurs around Halloween: Costume Bowling! To even out the competition a little, Timucuan members always bowl with a modified version of “Scotch Doubles” rules where the child bowls the first frame and the parent tries to pick up whatever their child missed. We play two games with our tribes, and the scores are combined for entry into the competition. The top three teams win a trophy. We had an impressive show of scores, with handful of father-child teams bowling their way into the low 200s. One of our newest members, a 5-year-old girl from the Cayuga tribe, won the third place trophy! Whether a trophy was won or not, two hours of fun and laughter carved some special Halloween memories for our families. You can read more about Timucuan’s Costume Bowling event on our website.